I promise I will eventually make it as far as the Pope’s Cross to photograph it, but every time I head in that direction something catches my eye and that’s me done for another hour or two. At least this time I actually managed to capture the cross, somewhat in the background but at least it’s actually there. There are hundreds of these wild gnarly looking trees all over the park, I simply can’t resist photographing them to be honest. I love the fact that they always seem to be just sitting in a wide open space all on their own, for some reason they never seem to grow in groups. This makes me think of them as some kind of grumpy loner that doesn’t enjoy the company of other trees, you can almost imagine them shuffling along in their early years until they find a spot in the park where they won’t be disturbed by the other trees. It may seem like a crazy idea but part of me does believe that trees can communicate with each other in some way or other, don’t ask me to explain it, you either believe or you don’t. I tend to approach these angry-looking lads with plenty of caution, it’s best not to get too close, you can never be too sure. They may be small but I have yet to see anybody brave enough to try to climb one of these little fellas, they are covered in prickly spines, even the squirrels dare not attempt. You need to be very quiet when near one of these trees and don’t ever turn your back on them. 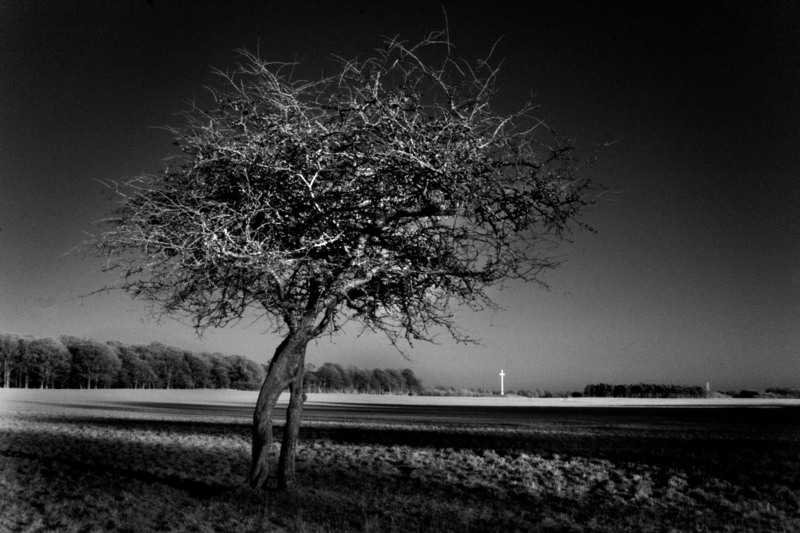 This entry was posted in Black and White Photography, Infra-red Photography, Irish Landscapes, Phoenix Park and tagged Infra-red Photography, Phoenix Park. Bookmark the permalink. ← The Perfect Winters Day. I love this photo and agree that some trees do look angry. Glad you were not injured in the process. Looking forward to seeing more. Thanks for your kind comments, glad to say I am still safe. They may be angry but they trust me……..I think.